I know that high-low dresses and skirts have been around for ages, and to be honest I haven't really liked them until now ... well lots of them anyway, especially the ones where the front is VERY short, and the back is VERY long. Just not my cup of tea ... maybe a little too much like a mullet haircut... you know the old 80's business in the front, party in the back. Hmmmm! Anyway, I've seen a few high-low skirts and dresses in the shops with a much more subtle high-low effect, and decided I really liked them. It's fun when my tastes change and a whole new world of sewing options open up! I've also found my fabric-matching taste changing lately. I never would have put stripes with a busy fabric like this before, but I just love this combo right now. Anyway, so I decided Bethany needed a new dress (stop laughing ... I know my girls never really NEED a new dress! ), and one that will hopefully still fit next summer seeing as our warm weather is slowly coming to an end. I wanted a quick project, and a dress that would be comfy to wear, but also cute for going to a birthday party or out for lunch. This is what eventuated... 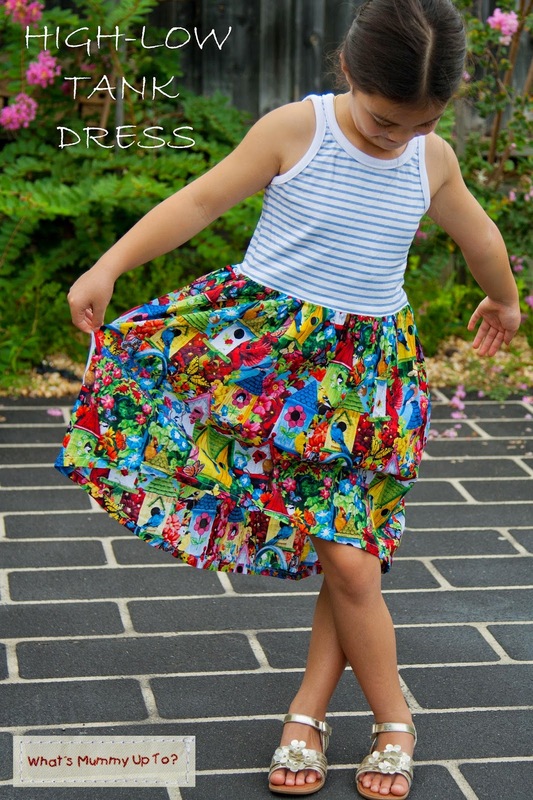 The High-Low Play-Time Dress, and Bethany's a HUGE fan. She loves this dress, and if it's clean and hanging in her wardrobe, she will most likely pick it to wear for pretty much any occasion. The skirt fabric I used here was one I picked up about a year ago with the intent of making myself a kimono. But after thinking about it, and almost cutting it out several times I decided it was probably going to be too bright and showy for me to wear, and I decided to re-stash it for a better project. 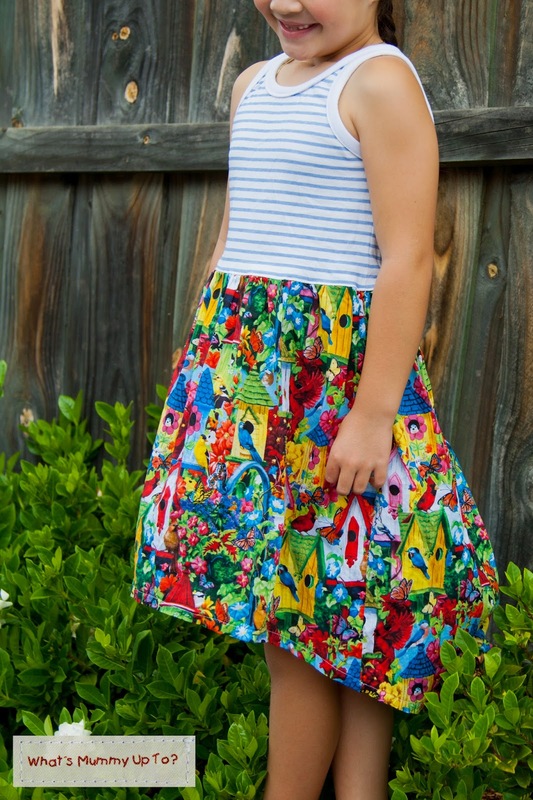 So glad I did because Bethany chose this fabric excitedly for this project, and I love how happy and playful it is. 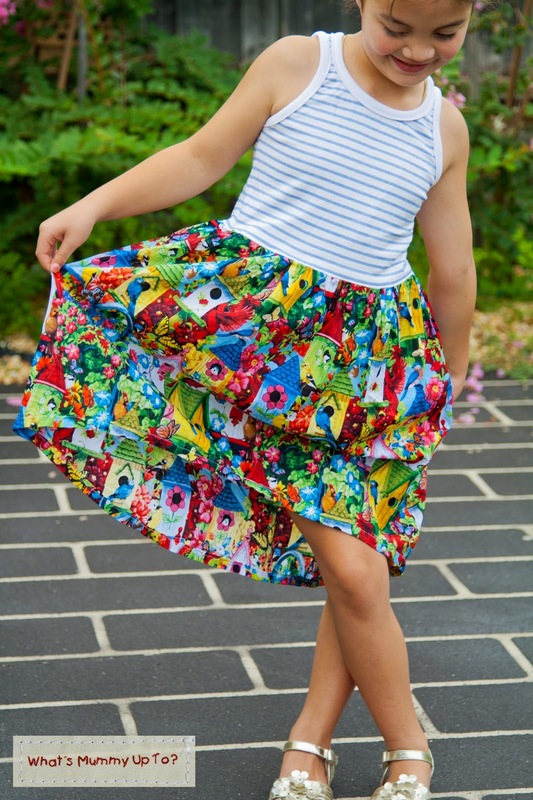 She loves birds at the moment, and the fabric is covered with brightly coloured birdhouses and birds. So perfect for my girl right now. 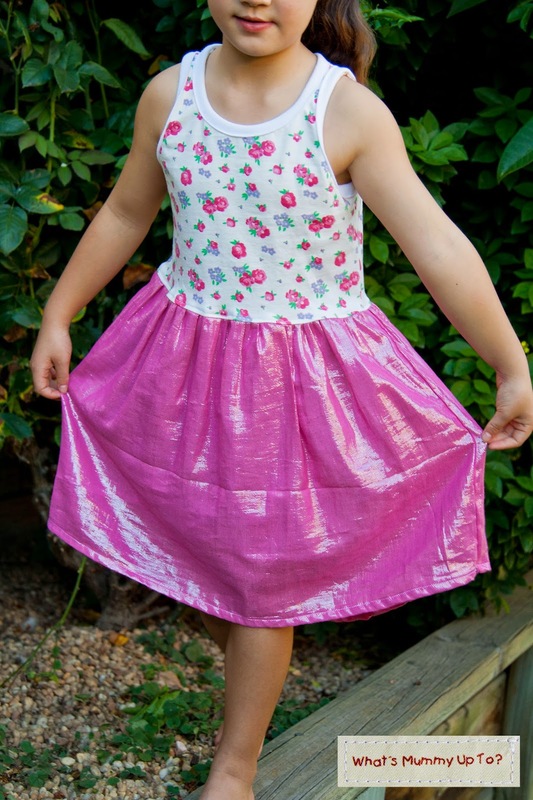 So, this dress is such an unbelievably quick and simple sew, with such a fun result that I've made a few more and put together a tutorial to share with you. Not in to sewing?? Why not?? ... give it a go! Still no? OK, don't worry I've got you covered! I've made up a couple of extras and listed them for sale in my shop. I've made them in the sizes my girls wear (size 7 and size 4) because that way I could be sure that I was making the skirt lengths right. If you have girls in these sizes, take a look. , and just to change it up, I used a different fabric for the bodice of each dress. If you want one in another size don't hesitate to get in touch, and I'll see what I can do. I still have a little of this birdhouse fabric left, but not much so first in, first served! 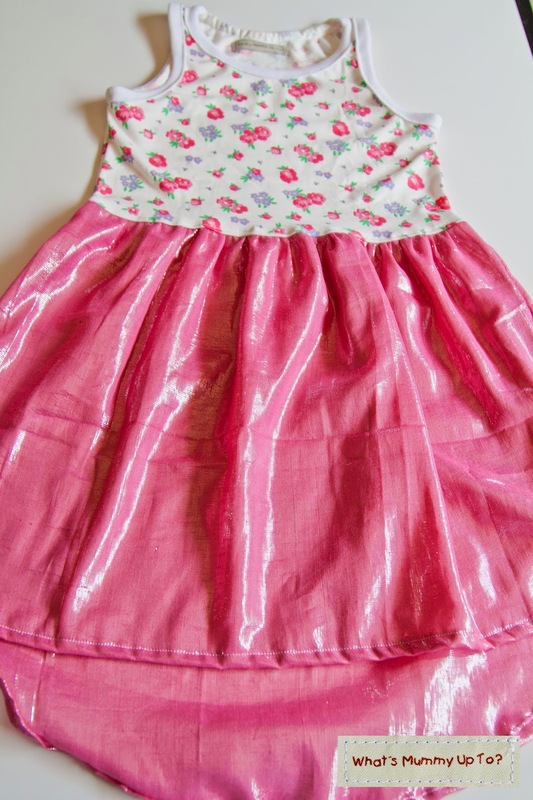 This time with a sheer, voile-type fabric, that has a silver-coloured thread through it making the whole thing shimmer ... little-girl-heaven! 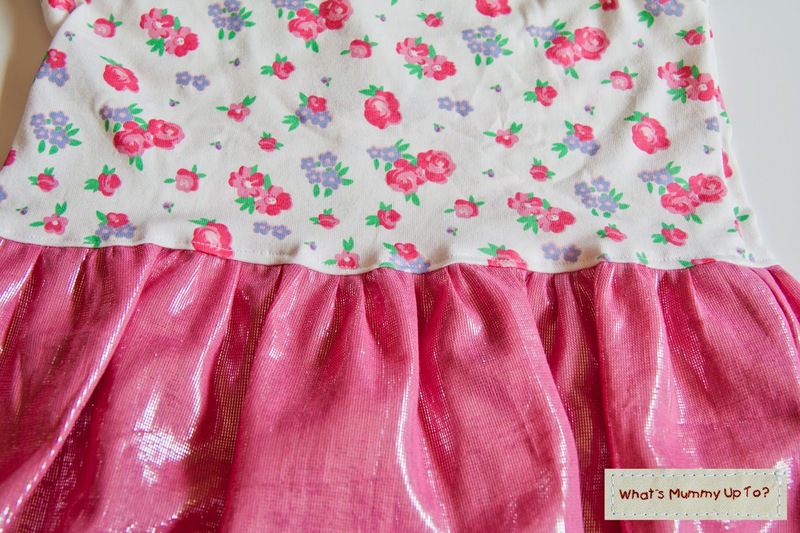 As the skirt was a little sheer, I added a light weight lining under the skirt of this one (I recycled a light-weight voile baby wrap for the lining ... love a good waste-not-want-not! 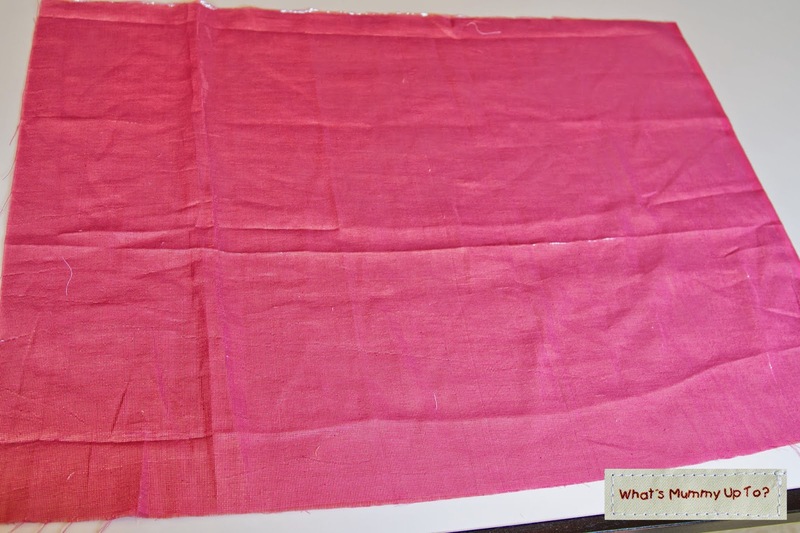 ), which ends about 6 inches from the bottom of the front hem. Bethany loves this dress too. I used this ever-so-cute birdie seer-sucker. 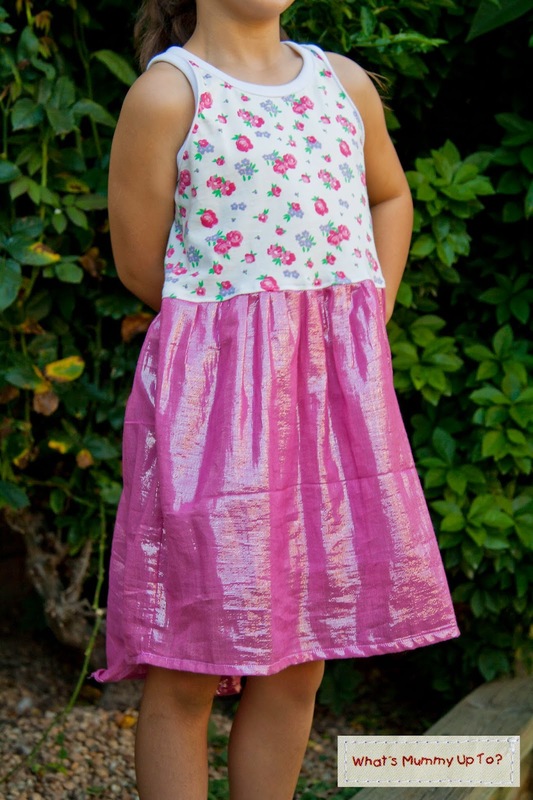 The thicker, stiffer texture of the seer-sucker makes the skirt appear slightly more full, and I think that is so adorable on a little one. Hannah is very impressed with this dress too, and calls it her "cape-dress". Hannah's actually wearing a size 3 mostly at the moment, but I really want this dress to fit next summer (this kid just keeps growing! ), so I made up a size 4, and it totally works. 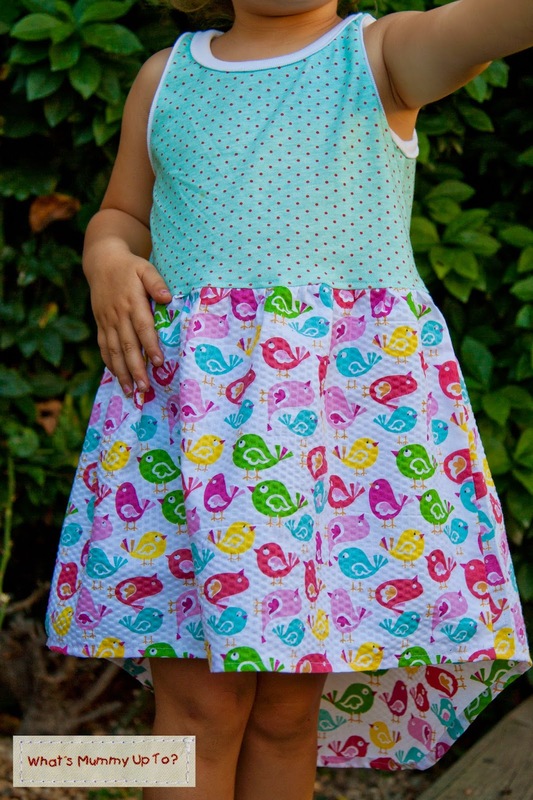 Oh, and I had the tiniest little piece of this birdie fabric left, so I made a tiny pair of baby shorts with a matching appliqué tank and added this for sale in my shop too ... such a cute little gift for a little summer baby ... take a look! - Tank Top Pattern. If you don't want to buy one, you could just draft your own using a top that fits like I did for this dress. Otherwise there are many around for sale if you do a google search, or this is a good freebie in sizes 3-8. - About 1/2 metre/yard Knit Fabric - I used a Jersey-weight fabric. - Small piece of knit ribbing or coordinating knit fabric for the neckline/arm holes. 1. Assembling the bodice - Cut out your front/back pattern pieces, then fold up the bottom of the pattern to make the tank about half as long between the arm-pit and the bottom, like so. 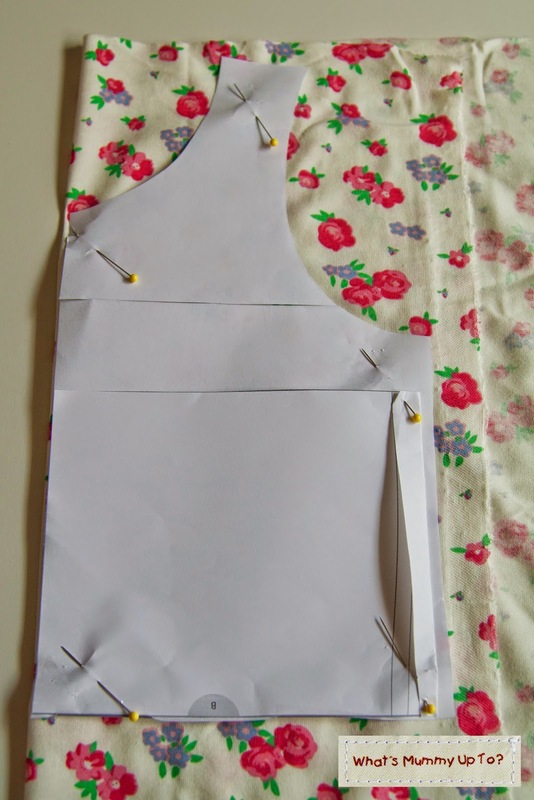 Cut out your front and back bodice pieces using your tank pattern on the fold. Make sure the stretch goes horizontally across the bodice. you'll end up with 2 pieces like this. 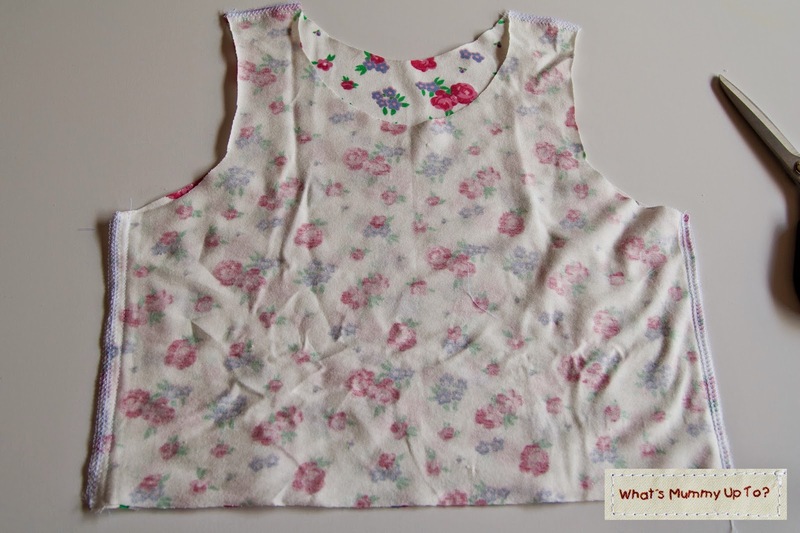 Place your front and back pieces right-sides-together and sew the shoulder seams and the side seams like so. 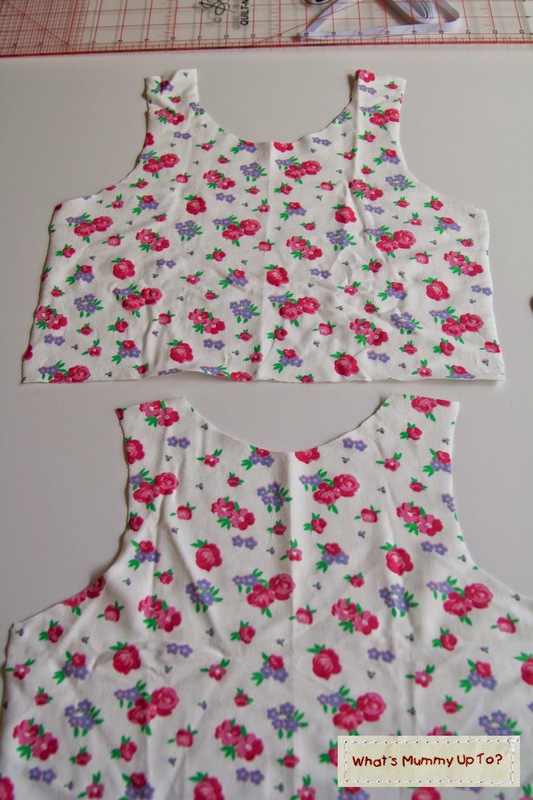 You can also finish the raw edges using an overlocker (serger) if you like, though it's not absolutely necessary for the bodice section because knit fabrics generally don't fray. 2. 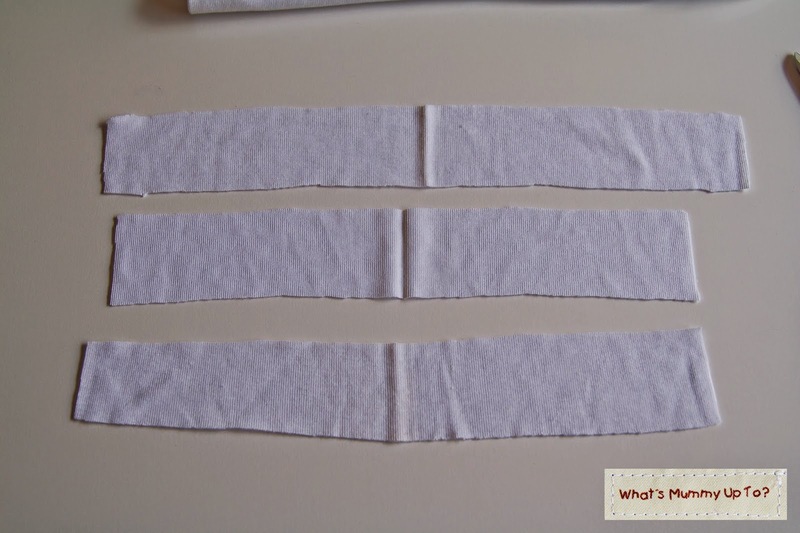 Cut the binding for your neckline and arm holes - First grab your ribbing / coordinating knit fabric, and cut a 3 inch wide strip, making sure the stretch goes along your strip. Then measure your neckline and deduct 1-2inches (depending on the stretch of your ribbing). For stretchy ribbing, deduct 2 inches, for not so stretchy, deduct only 1 inch. Cut your long strip to this measurement, and repeat the process with your arm-holes so you have three strips of ribbing like so. 3. To attach the ribbing I use a great little technique I learned during a pattern-test last year. I love the finish of this because there are no raw edges, and I also find his technique is much easier to do neatly ... a plus for me as I've always struggled with knit-fabric necklines. This technique has really made my necklines look so much more professional. 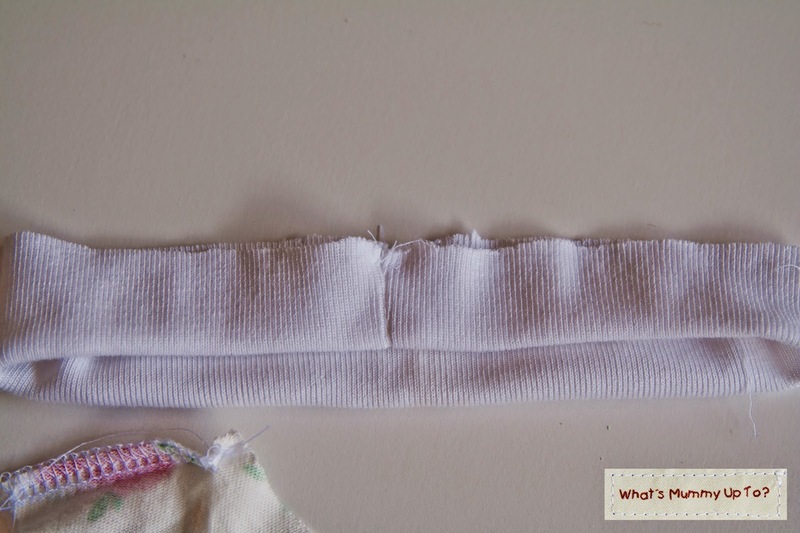 So, starting with the neckline strip, fold it in half right-sides-together and sew to form a cylinder like this. 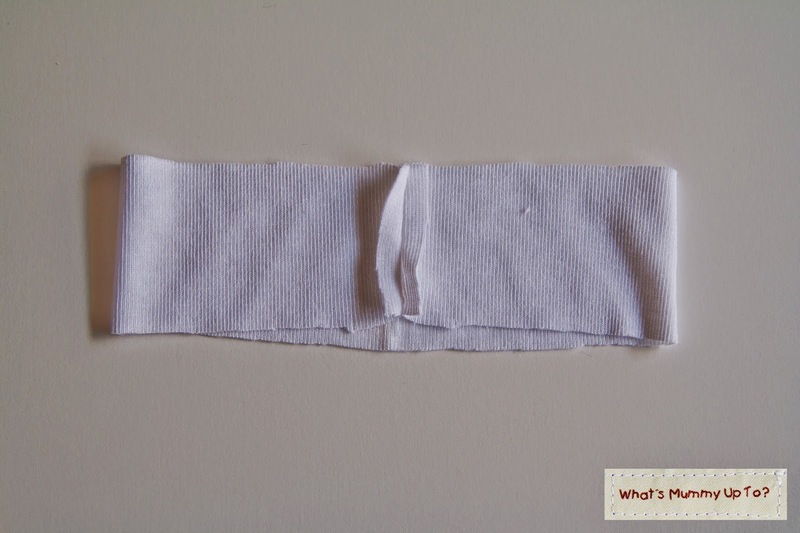 Fold the whole neckline in half, enclosing the seam allowance like this. Matching the seam to one of the shoulder seams on the bodice, pin to the WRONG side of the neckline like this. 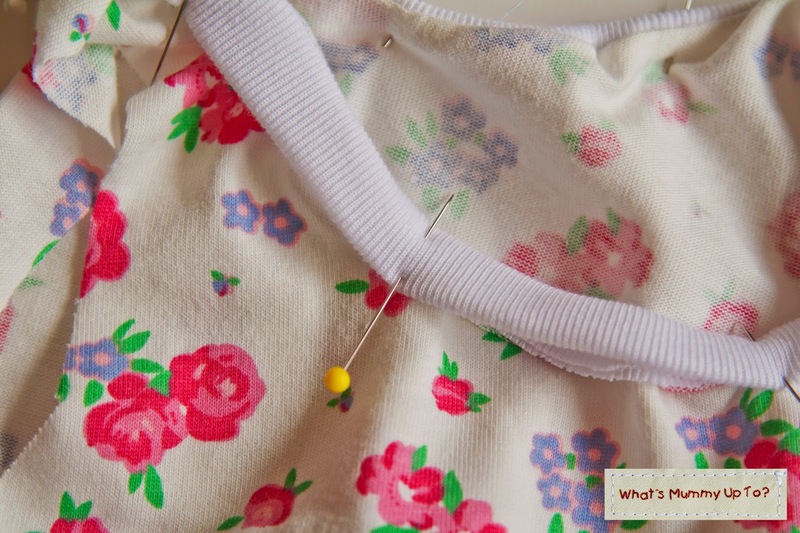 Try to pin it evenly, using lots of pins, and remembering that your neck band is slightly smaller than the neckline on the tank, so you'll have to stretch the neck band as you sew. Starting at a shoulder seam, sew around the neckline using a 1/4 inch seam allowance all around. Backstitch at the beginning and end to hold it firm. Your neckline will now look like this, and totally looks as though you've sewn it on backwards ... but wait, there's more!! 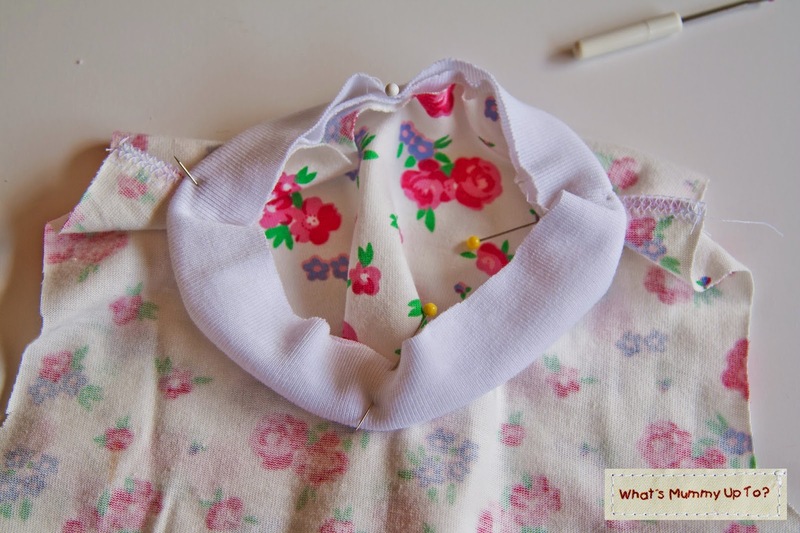 Turn your bodice right-side-out and fold the neck band over to the right-side, enclosing the raw edges. Pin well. 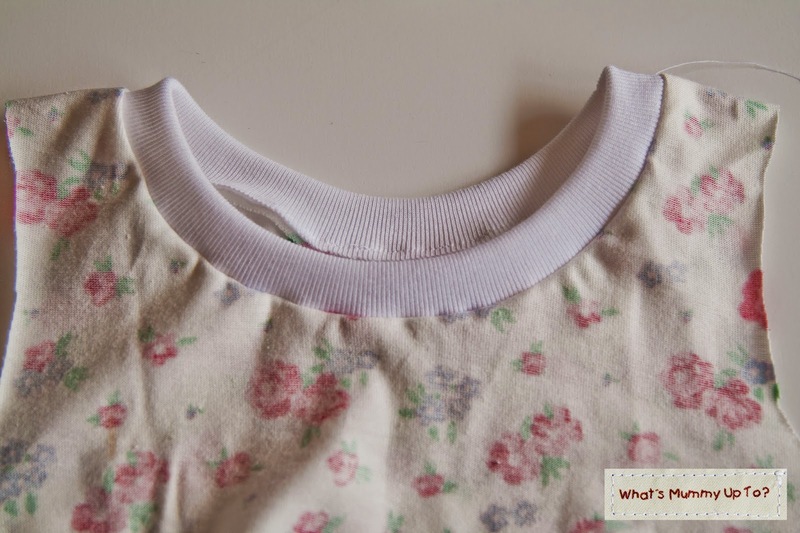 Sew around the neckline, top-stitching the neck band down to the front. Then repeat with both arm-holes. And ta-da ... this is absolutely the neatest way I've ever seen for necklines with knit fabric .... love it!! 4. Cutting out your skirt pieces - Measure your munchkin from their waist (just above their belly-button) to their mid-calf and add 1 1/2 inches. This will be the length of the skirt pieces. Then lay your bodice flat on the table and measure the width. Double this figure, and this will be the width of each skirt piece. 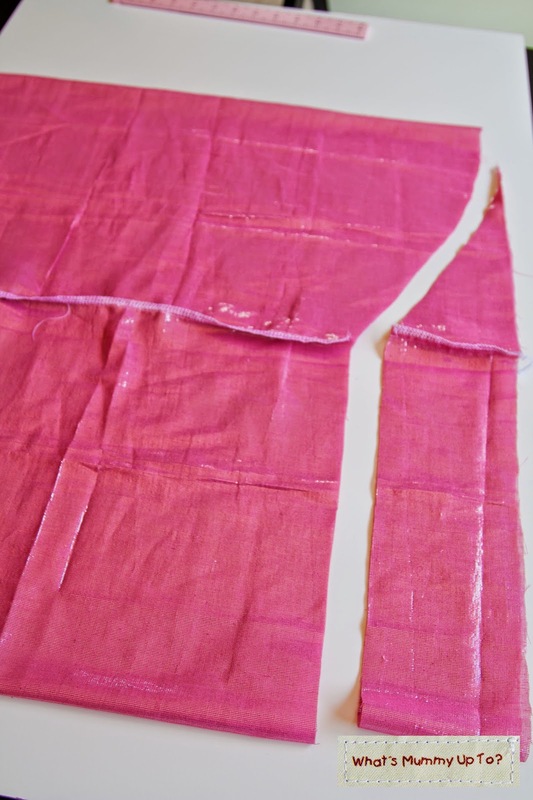 Now you can cut 2 rectangle skirt pieces using these dimensions, and sew these pieces right-sides-together down each side, finishing the seams with an overlocker (serger) if you have one, or by zig-zagging along the seam allowance. 7. Attaching the skirt to the bodice - Set your sewing machine to the longest stitch-length (on my nice shiny new machine, it's 5.0). 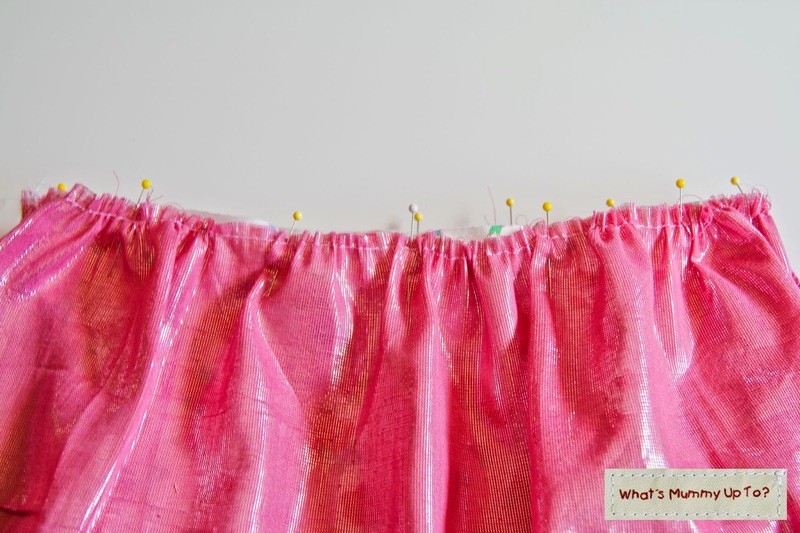 Now on the top edge of the skirt, sew a row of stitching 1/4 inch from the edge starting at one side seam and sewing all the way around to the same point. Don't backstitch, and try to leave long tails so you can find a thread to pull for gathering. 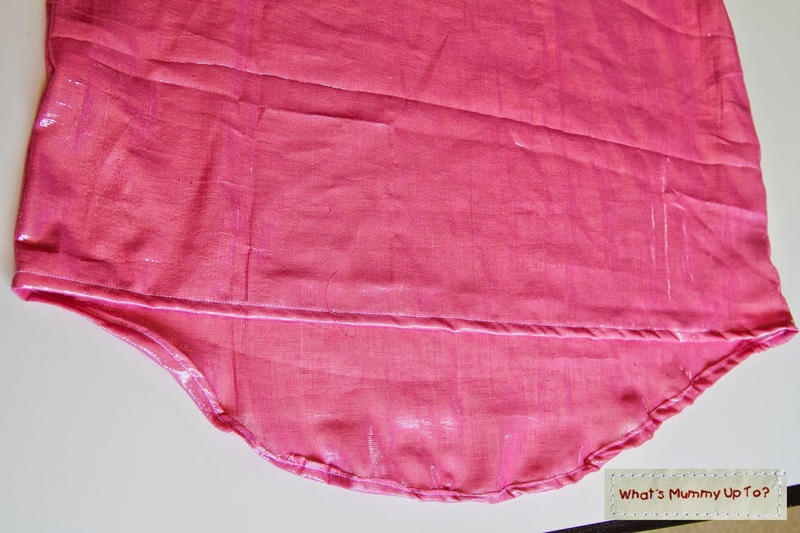 Sew around, starting at a side-seam, and with a 1/2 inch seam allowance, and back-stitching at the beginning and end (oh, and just double-check you've put your stitch length back to normal ... I always forget that!!). 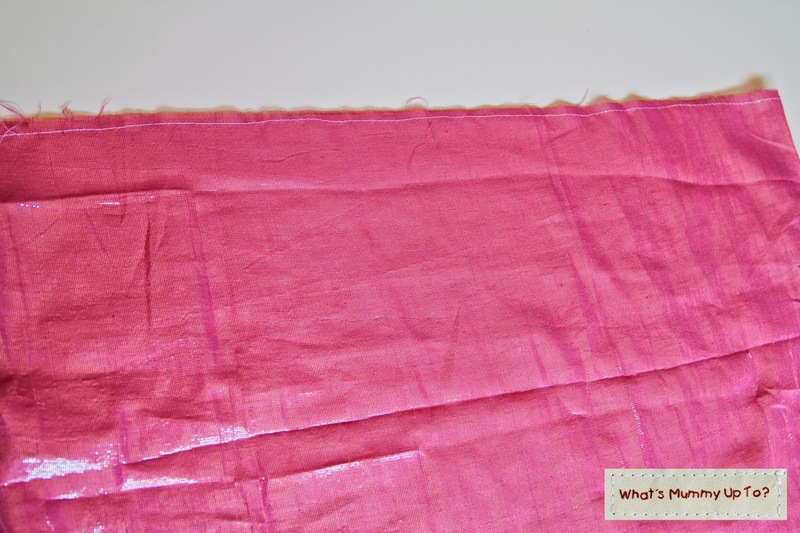 Finish off your raw edges with your overlocker (serger) or by zig-zagging around the seam allowance. 8. Last of all, turn the dress right-side-out and press the seam allowance at the waist up towards the bodice. Then topstitch around the bodice, about 1/8 inch from the seam, catching the seam allowance on the back all around. This just neatens up that seam allowance, makes the waist a little more comfortable to wear, and finishes off the look of the dress. If you're worried about the stretch of the knit fabric being compromised at the waist by top-stitching, you could lengthen your stretch a touch just to make it a bit looser. However, I've never had any worries with stitches pulling out or anything at the waist, so I wouldn't worry too much about it. And there you have it ... a comfy, summery dress that's practical for playing in, but cute enough for party-going or out for lunch. As always, I'd love to hear from you if you make one of these for a little girl in your life. Feel free to email me and send me a pic, or even post on my wall on Facebook. It always makes my day when I hear from you! I really like this. I have an almost five year old granddaughter that I could do this for. 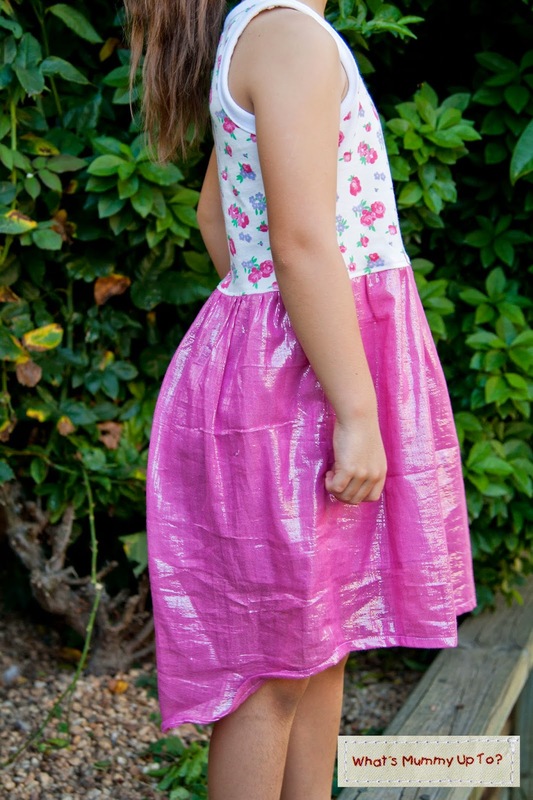 I've never thought of doing a Hi-Lo dress for this age, But I have made Hi-Lo for the older ones. You have inspired me. Thanks for sharing. Love the bright, fun fabric in the first dress, Wen. Co-ordinates so well with the striped fabric. 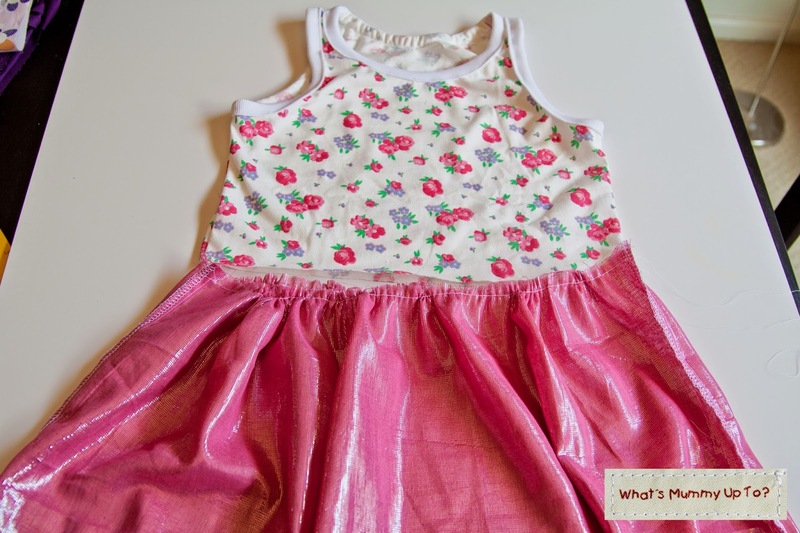 can't wait to try this dress; looks easy and oh so cute...for my granddaughter ............also would like to buy a different sewing machine; simple and inexpensive.....what would you all recommend?? Hi Laurie, I'm sure your granddaughter would love this dress. 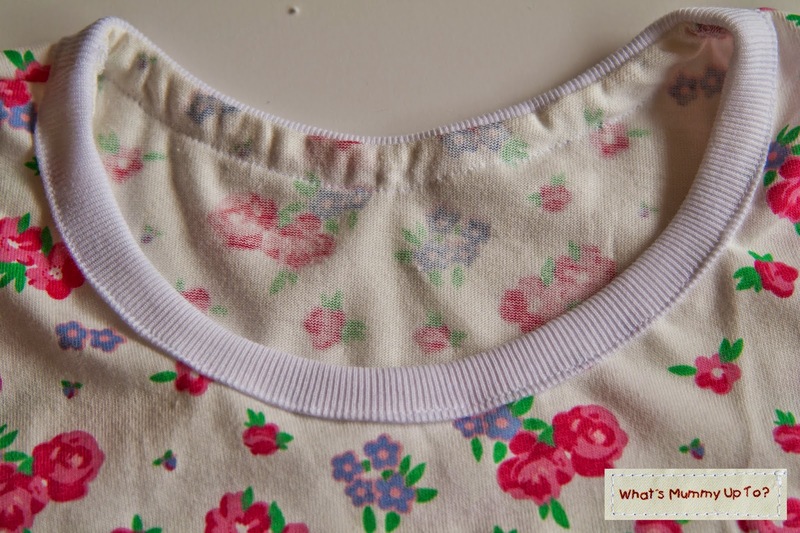 My girls have certainly had a lot of wear as they are so comfy with the tank-style bodice. I recently had to get a new machine too when my 30+ year old Pfaff dies. It was a very sad day, as this was my Mum's sewing machine and the only machine I had ever sewn on. Anyway, I did a little research and asked some trusted friends, and in the end I chose a Janome. Not the most basic one, but a step up to give some extra stitches and features. It's a great machine and runs so smoothly. I've done a little quilting too, and it's gone so well with that. Have fun sewing-machine-shopping, and don't be afraid to ask the sales assistant for a test-drive of the features! I love this style :) can't wait to try this dress, looks easy and oh so cute.. Thanks Amelia! There really is nothing hard about this one! Thank you so much for this. I have a granddaughter that is 14 months old and this is a great idea for her as she grows. 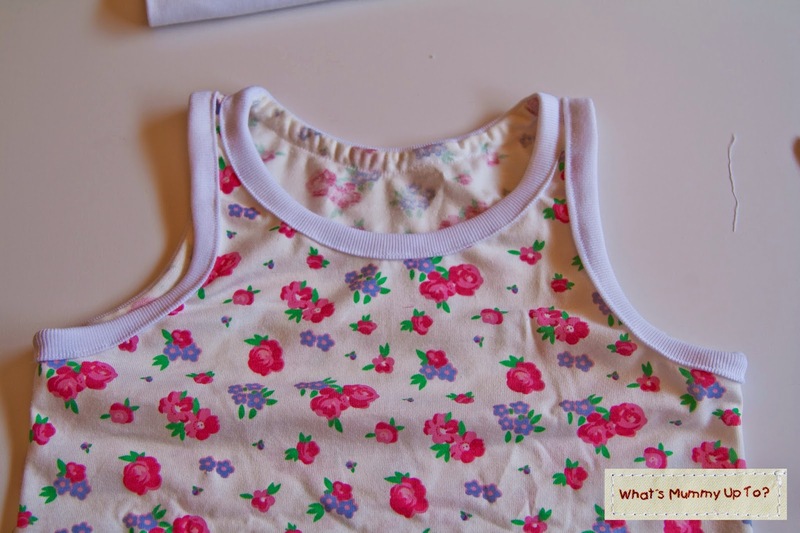 I had a thought while I was reading this; What if you had an already purchased tank top that maybe is a little short but still fits your little girl, couldn't you add the skirt to the bottom of the tank top? Just a thought. Thank you again for the inspiration. Hi JoDee, You absolutely could attach a skirt to an exiting tank top. In fact I've done this before with a few tops/t-shirts to get extra wear out of them! Great idea!! GREAT JOB WEN I REALLY LOVE IT!!!!!!!!!!!!!!!!!!! I have just discovered your blog and I am so excited to try some of your projects for my granddaughter. Your instructions are so good. I appreciate the time you have invested in this. My question for this project: is it hard to get the dress on? I'm concerned about pulling it over the shoulders since the skirt is not made of stretchy material and there are no buttons or zippers. Hi There, we've never had any problems getting the dresses on. If you're worried, you could size up 1 size for the tank, and this would give a little extra room around the middle. I'd live to see what you make. Feel free to email me and show me! !